To understand the full scope of American history, one must acknowledge and respect the significance of the ongoing undercurrent of artistic contributors. Students should be encouraged to think and explore the world of literature. An appreciation and understanding of fine works of classic literature, poetry, and essays, as well as the development and contribution of the literary segment of our population throughout America's history, will serve only to enhance a student's academic career and perspective on the world around him. Following each literary passage are several multiple-choice and open-ended questions. These questions are designed to highlight and reinforce important points about what the students have read, and help them to apply reasoning and critical thinking to the literary work. By asking students to immediately recall and consider facts and concepts they've just read about, the aim is to affix in their minds the overall ideas and some of the more essential details of the themes about which the selected authors wrote. This workbook series can also be used as a companion to our The History of American Literature, a comprehensive history of the subject in workbook form. Download the sample pages below to see tables of contents and view the list of passages included in either volume I or volume II of this series. Choose from the following menu to download a PDF of a few sample pages from one of our Readings in American Literature workbooks. To better facilitate the ordering process, please use the following product codes when placing your order. 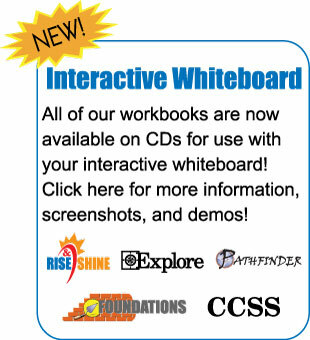 Click here for information on interactive whiteboard versions. 15-29 Student Workbooks: $13.95 ea. 30+ Student Workbooks: $12.95 ea. Additional Teacher Editions: $14.95 ea. Queue workbooks are copyright protected. Workbooks may not be photocopied or duplicated. Teacher editions may not be purchased separately. You may purchase 1 teacher's edition for every 15 student workbooks of the same title. Contact Queue sales by phone at (800) 232-2224 or by fax at (800) 775-2729. You can also download and print out our order form. Ordering information can also be found on our Policies page.